But Josh Bush tweeted about a regular expression game that Erling Ellingsen built. There’s 15 levels that exercise different expressions in regex. I’m currently at 3293 but I’m positive I can break 3500 at some point in the near future as I don’t really feel like I’ve cracked Glob, Prime, or Triples. Yesterday we updated somewhere around 90 VMs for modern.IE. This has been incredibly well received by most people but there was a little bit of "snark" that 90ish VMs was too many. But let’s break that down actually. The reality is that we’ve got 9 client OS/browser combinations. That’s a little more manageable and remember that two of those will drop off (theoretically) in just a few months. How we get to 90ish is that then we cover virtual machines that run on 3 different OSes across all of the major virtualization platforms. There’s a bunch of host OS/Virtualization platform combinations. If you multiple the guest OS/browser combinations and the host OS/virtualization platform combinations, you end up with a LOT of VMs but the reality is that you will only ever need to download a small handful of these at any given point in time. The really good news, however, is that all of these options are free on the modern.IE Virtual Machines page when you need them. 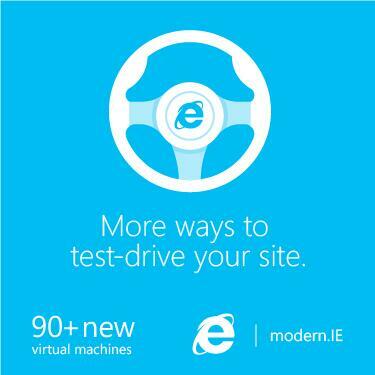 modern.IE has free virtual machine downloads for testing Internet Explorer. As I mentioned in my last post about modern.IE, my team’s core mission is to write interoperable web sites across all of the major browsers and to help that, we’ve put together a set of tools to help you test cross browser and cross platform. The latest step that we’ve taken is that we’ve updated all of the VMs that we support which is a giant list. The updates include getting them up to date with security patches, latest versions of the right browsers, such as IE11 on Windows 8.1 and Windows 7, and more. The virtual machines include a lot of different Windows OS and browser configurations. To set expectations correctly, these are 90 day VMs. In other words, every 90 days they will expire and you can come back and download a new one that’s all up to date with the latest security patches but these are not just free Windows machines forever. If you are testing web sites across multiple versions of Internet Explorer, I highly recommend that you go to the virtual machines page on modern.IE and download the latest VMs. I’m a Program Manager on the Developer Relations team for Internet Explorer. The core mission of my team is to help developers write interoperable web sites across all of the major browsers. To that end, we have put together a set of tools and downloads that will help you testing, especially for Internet Explorer but most of the tools help across app browsers. Once you’ve scanned your site and reviewed the static results, you can take a look at how your site looks across a lot of browsers with the screen shot service by Browser Stack and also do a scan for code that’s no longer supported by current versions of Internet Explorer. It will save you a bunch of time testing and looking for issues to scan your web site with the modern.IE Scanner. The scanner is great but there’s nothing like looking at the real thing. To help here, the team has put up a large set of virtual machines to help you out here. These virtual machines are designed for you to do Internet Explorer testing. This is a lot of machines. If you count up all the variations of virtualization platform, OS and browser, it’s a little over 90 VMs that we’ve got for you to download. These are 90 day VMs because they are not activated VMs. This means that in 90 days, you’ll need to come back and download a new one but that’s a good thing because we’ll be keeping them up to date with security patches and the like on the web site so you don’t have to think about it. There are also partner offers that we give from time to time ranging from some percentage off of Parallels to a 3 month trial of Browser Stack (rather than their normal 1 month trial) and so on. These change from time to time so I’m not going to go through all of these here. There’s a ton that the team is doing which is all aimed at helping web developers build an interoperable web. What I hope never happens again is a “Best viewed in X Browser” tag on a web site again.